Original publication date: Sunday March 11, 2007. Layers of silica nanorods look like shag carpet (top) when viewed with a scanning electron microscope. When coated on a surface (bottom), the new anti-reflective material looks dark (left) in contrast to other anti-reflective coatings. Researchers have created an anti-reflective coating that allows light to travel through it, but lets almost none bounce off its surface. 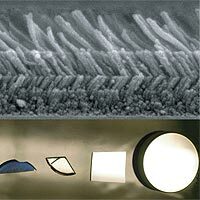 At least 10 times more effective than the coating on sunglasses or computer monitors, the material, which is made of silica nanorods, may be used to channel light into solar cells or allow more photons to surge through the surface of a light-emitting diode (LED). Publishing in the March 1, 2007, Nature Photonics, lead author Jong Kyu Kim and a team from Rensselaer Polytechnic Institute in Troy, N.Y., reveal how they crafted the coating, which reflects almost as little light as do molecules of air. Guided by National Science Foundation-supported electrical engineer Fred Schubert, the researchers developed a process based on an already common method for depositing layers of silica, the building block of quartz, onto computer chips and other surfaces. The method grows ranks of nanoscale rods that lie at the same angle. That degree of the angle is determined by temperature. Under a microscope, the films look like tiny slices of shag carpet. By laying down multiple layers, each at a different angle, the researchers created thin films that are uniquely capable of controlling light. With the right layers in the right configuration, the researchers believe they can even create a film that will reflect no light at all. One critical application for the material is in the development of next-generation solar cells. By preventing reflections, the coating would allow more light, and more wavelengths of light, to transmit through the protective finish on a solar cell surface and into the cell itself. Engineers may be able to use such a technique to boost the amount of energy a cell can collect, bypassing current efficiency limits. Another application would involve coating LEDs to eliminate reflections that cut down the amount of light the LED can emit. The researchers hope the efficiency gains could allow the light sources to compete more effectively with fluorescent and incandescent bulbs. So, they will next focus their attention on solid state lighting.